Jared Unzipped: Living In Hell: The Life Of A Feral Child. What's more sad, pitiful, depressing and frightening than a feral child? Throughout recorded history, cases of genuine feral children do turn up. 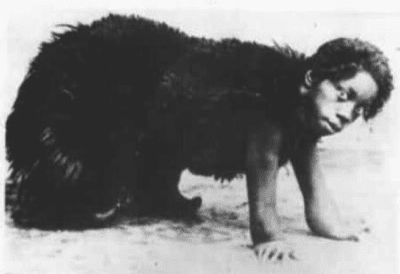 What is a feral child? It's a condition linked to a child being left alone in the wild by unwanting parents, often because of a mental or physical disability. Once alone, they'll often find themselves raised by another wild animal, eventually becoming a member of some another species' community. 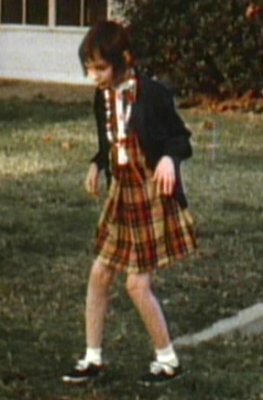 Feral children can also erupt from severe abuse as a direct result of isolation from human contact. Kids whom are locked in single rooms, attics or basements with no outside interaction often become feral. The only known photo of Ramachandra. One of the strangest and most well-documented cases is that of a boy known only as Ramachandra. He was found in the early 1970's in the Uttar Pradesh region of India. Eyewitnesses stated that he acted like an amphibian and ate raw meat. He could walk, but with a very awkward gait and typically preferred to crawl. More often than not, Ramachandra would be found spending his time in the local river, much like a frog. By 1979, he'd been forced into living a modern life by villagers, with poor results. In 1982, a woman killed him with a pot of boiling water. Claims state that the woman was frightened by his approach and she acted in self defense. Natasha, a five year old girl from Chita, Siberia, was found in 2009 by local Russian police. She'd been locked in a room with cats and dogs since before the age of two. Her behavior was not human-like at all. She would bark and jump at caretakers upon them leaving her room. Natasha ate food from a dish like a dog and never used her hands. She crawled on all fours. Given that the news is from one of the most remote locations on the planet, any further news about her survival has not been released. Another troubling case from Russia involves a nameless boy. After the story of his horrible existence broke in 2008, he was referred to in local newspapers as the Russian Bird Boy. The boy's mother had locked him naked in a two-room apartment filled with a variety of birds. She never spoke to him and treated him completely like any other pet. Upon discovery, law enforcement were shocked to find that the boy would chirp to communicate with the birds living around him. He would also flap his arms to communicate, much like the birds. This photo of Genie was taken a few weeks after her rescue. She was being cared for at the Los Angeles Children's Hospital. Genie had what was known as a "bunny walk". One of the most famous cases of a feral child is that of Genie, which is a pseudonym as to protect her real name. She was discovered by child protective services in Los Angeles, California on November 4, 1970. Genie's father, for reasons unknown, decided that she was mentally handicapped while still a baby. By the age of twenty months, he'd locked her in a room alone. Genie remained in that room until she was approximately thirteen years old (her birth date is not known). Her father indicated after his arrest that he left Genie strapped to a child's training toilet or tied to a crib for most of her existence. Genie could not speak, nor did she understand any of the typical social constructs that most children gain in their early years. Genie is still alive and resides as a ward of the state of California. In her time, she has learned a few words, but usually communicates through rudimentary sign language. I find it amazing how children can be such a clean slate from which to grow and change. Given the right tools, care and social interaction, a human child can grow into a responsible adult. Yet, if children are isolated and abused, they can grow to never be human at all. I believe this says a great deal about how important love and compassion are when raising a child.